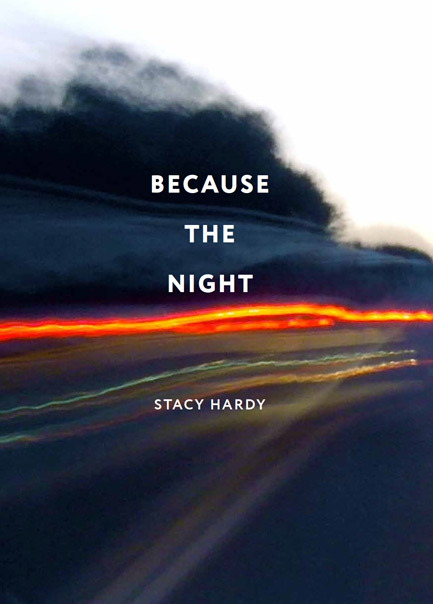 Stacy Hardy’s first collection of stories, Because the Night, is part book, part art object, an uncanny collaboration between the author and Italian photographer Mario Pischedda. Pischedda’s electrifying images serve as cover, end page, and visual contact between each story. An image precedes the title page of each story and behaves as augury for what comes next; the same image acts as a vapor trail, a sizzling remnant of the story just concluded. Thus, each photographic image illuminates the synapse between stories and does a great deal to augment the unity of the stories’ effect. The images can be soothing, though more often, fractals come to mind; cosmic fissures; lines on tarmac; lighted buttresses, blurred as if in motion; a streak of lightning; a lone headlight rending the saturated dark of the veld in which these stories are set. The images give you a feeling of place without figure or detail; they are stark, unnerving, watery, moving. They let you know you’ve arrived just a moment too late. Arriving a moment too late is a recurrent theme among these twenty-one stories of race, power, and sexuality in contemporary South Africa. Hardy is a wizard in her evocations of absence—the vacancies between people in proximity; the longing for those we cannot reach; the estranging paralysis of witnessing the horrific. Because the Night is replete with darkly fluid narratives about people on the move—a couple on a killing spree; hitchhikers caught on the Transkei at dusk; a woman searching for her missing brother. Whether flown into the fantastic or bound to the literal, Hardy’s writing issues from visceral experience, from the fusion of a playful intellect and a keen sensitivity to the coded messages the physical body sends. Appetite, she seems to say, saves us—our fascination with the possibilities of language, and with our mutable, physical selves. Violence, love, sensation, release, our confounding, insatiable needs keep us alive, make life possible. One can read a long way into the literature of any continent and find little which speaks so powerfully and with such candor about the life of body, the quickness of the mind to depart, as Because the Night. We cannot hope to escape, these miraculous stories insist, but let us shake the grates, feel what there is to feel, find each other, and live. This entry was posted in Uncategorized and tagged Summer 2015 on June 29, 2015 by Kelly.